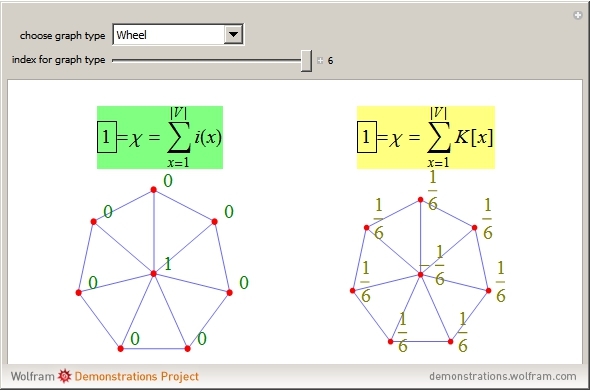 Two representations of a selected graph are shown. 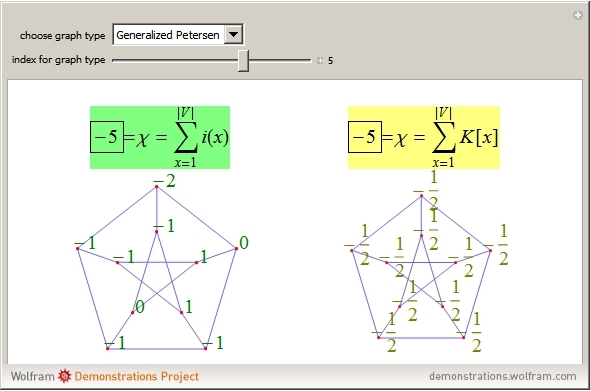 On the left, the vertices are labeled with the indices, which add up to the Euler characteristic of the graph. On the right, the graph is shown with curvatures, which also sum to the Euler characteristic. 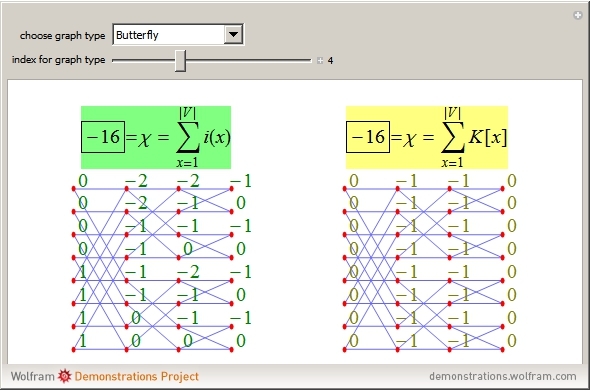 The left graphic illustrates a Gauss–Bonnet theorem for graphs. The right graphic illustrates a Poincaré–Hopf theorem for graphs. The Gauss–Bonnet theorem for graphs is covered in  and . The statistics about curvature and dimension are covered in , where explicit formulas for the average dimension and Euler characteristic of Erdos–Renyi probability spaces can be found. proves a Poincaré–Hopf theorem for graphs. The main ingredients are local quantities curvature and index , where denotes the Euler characteristic of a graph and is the part of the unit sphere where is smaller than . theorem; see , which also explores it in a more geometric setting. The sum of all the indices is the Euler characteristic. This is a discrete version of a Poincaré–Hopf theorem . O. Knill. "A Discrete Gauss–Bonnet Type Theorem." arXiv. (Sep 13, 2010) arxiv.org/abs/1009.2292. O. Knill. "A Graph Theoretical Gauss–Bonnet–Chern Theorem." arXiv. (Nov 23, 2011) arxiv.org/abs/1111.5395. O. Knill. 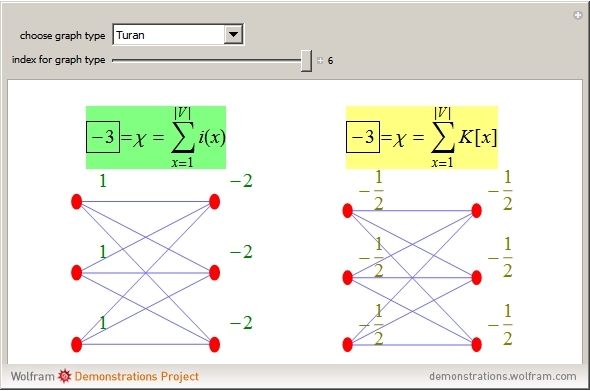 "On the Dimension and Euler Characteristic of Random Graphs." arXiv. (Dec 24, 2011) arxiv.org/abs/1112.5749. O. Knill. "A Graph Theoretical Poincare–Hopf Theorem." arXiv. (Jan 5, 2012) arxiv.org/abs/1201.1162. "Gauss-Bonnet and Poincaré-Hopf for Graphs"